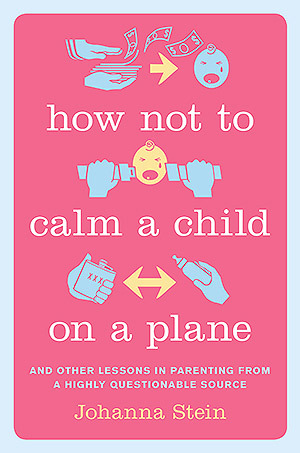 Last month, the actress, comedian, and writer released a new collection of essays, How Not to Calm a Child on a Plane (Da Capo, $20). Here she talks to us about growing up with a set of “tie-dye-wearing, dope-smoking, anti-establishment hippies,” how parenting has affected her comedy, and an overall lack of shame. PLUS: Enter here to win a free copy of her book! Surely everyone has wacky parenting stories. Was there a moment when you thought, “My life is weirder than everyone else’s, and this should be a book”? Or had you planned to pen this pseudo-memoir while you were still pregnant? I don’t know that my parenting life is that much weirder than anyone else’s. I just happen to be blessed with a complete lack of shame, so I don’t mind writing about things that most people wouldn’t dream of revealing. I will say this: my childhood was a lot weirder than everyone else’s (I was raised on the Canadian prairies by tie-dye-wearing, dope-smoking, anti-establishment hippies), and while writing the book I found myself looking back on the details of my childhood, not just as funny anecdotal stories, but as a comparison to the way my husband and I are raising our daughter. And the upshot is that even though my parents were pretty untraditional in their methods—and stoned a good deal of the time—they actually managed to raise a pretty intelligent, happy and productive brood. How do you think your daughter will react to the book when she gets older? I was very conscious to not write anything about my daughter that would come back to haunt her when she’s thirteen. On the other hand, the things I write about myself—I can’t guarantee that she won’t be horrified and want to pluck her eyes out of her head when she reads that stuff. How has being a parent shaped your writing style? Your comedy? It’s definitely changed my habits—I am much more focused now, because I have to be. Whereas before I had a pretty well-developed set of procrastination techniques (Clean the house! Play the guitar! Learn to re-plumb a sink! ), now the moment the kid is out the door I have to hit the ground running. Interestingly, although I have less time to write, I’m a lot more productive. And my house is a lot messier. Style-wise, it’s also made a difference—I come from a background in sketch comedy, and I’ve always had really absurd, silly tastes. I grew up loving Monty Python, SCTV, and Carol Burnett, and I rarely wrote from a personal place. But then I had a kid. That—combined with the fact that when she was a baby we moved to a new city (Chicago) where we didn’t know many other parents—inspired me to start writing about more personal, relatable things, like, “What the f–? Am I the only one who looks at the soft spot on my baby’s head and secretly wants to push on it really hard?” So yes, I’m probably more honest and reality-based in my writing now. But I still love the absurd stuff—a couple of years ago we moved back to L.A. and I got a job writing on an animated Disney show, Wander Over Yonder—which is about as absurdly funny as it gets. The ultimate Sophie’s Choice: which essay is your favorite, and why? I don’t have a favorite story—they’re all my imperfect little babies that I love and cherish and that, if I look at them long enough, I want to tear apart limb from wordy limb. I do have a favorite for how easy it was to write: the title story, the one about the disgusting (and mathematically improbable) thing that happened to me when I tried to calm my crying baby on a plane. That story flew out of me in an afternoon. I wrote it just like it happened—I barfed it out. Of my fingers. What are you hoping readers will glean from your experiences? Something more than a laugh? I honestly do believe that laughter is the best medicine—at least in the absence of powerful pharmaceuticals—so yes, my number one goal is that people have a good time when they read this book. I hope they laugh ‘til they puke. Though if they do, obviously I hope they dispose of it in a responsible manner. But aside from that, it would be great if this book can give some mom or dad a little bit of comfort. Becoming a parent is a shocking experience, and no matter how much you love your child, it can be tedious, isolating and really hard. So if I can help provide a little relief by giving people a reminder that they’re not alone in this, that would be great. Stein will be hosting a Q&A and a book signing tonight at Book Soup. 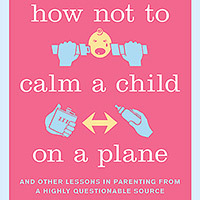 Enter here to win a free copy of How Not to Calm a Child on a Plane! Next article5 Things We Can’t Wait to Buy When Pop-up Market “Artists and Fleas” Visits L.A.